OK, so Titanfall isn't a launch title, but we've got over 20 launch titles, says Spencer. Microsoft, which recently put the squeeze on EA to ensure Titanfall's exclusive to the Xbox One, isn't worried that its mecha-shooter won't be available at launch. Yes, admits Microsoft's Phil Spencer, having Titanfall right at the start would have been great, but there are 20 other titles in the launch line-up. In any event, "we look at our preorder numbers, and we look at the anticipation in the market we're hearing from retailers," says he, "and I think we're going to sell about every piece of hardware we can build," Titanfall or no Titanfall. Besides, having it come out early 2014 could be great. People will have gotten over the excitement of the console's debut, played their games to death, and be looking for new fun by the time March 2014 rolls around. For that matter, the pre-order and launch cycle will have exhausted itself, and the initial console supply, but by March more hardware will be on the market. "So when I look at the timing of when that release is coming," says Spencer, "it's almost perfect for us as a platform." 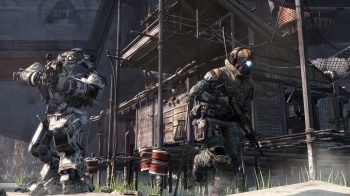 Titanfall's still the killer app, says Spencer, and Respawn's the perfect studio for a title like that. "To have them working on an Xbox game is incredible," says he. Nice that Spencer thinks so, since Respawn seems less than impressed with the idea of working on an Xbox One exclusive title. But Spencer's not wrong; Titanfall has had a lot of favorable attention since its debut, and there's no question it'll move units. But the next gen releases are so close we can taste'em. It's time to see how it all plays out on the Christmas battlefields.